For the car, see Bristol Blenheim (car). In early 1934, Lord Rothermere, owner of the Daily Mail newspaper, challenged the British aviation industry to build a high-speed aircraft capable of carrying six passengers and two crew members – he referred to the ambition as seeking "the fastest commercial aeroplane in Europe, if not the world". At the time, German firms were producing a variety of record-breaking high-speed designs, such as the single-engined Heinkel He 70, and Rothermere wanted to recapture the title of fastest civilian aircraft, as well as to purchase such an aircraft himself. Rothermere also intended to encourage businesses and key figures to make greater use of civil aviation, and to demonstrate to the British Air Ministry how their fighter aircraft may not be able to match modern transport aircraft, which may be easily converted to, or used as the basis for, a bomber aircraft. Since July 1933, Frank Barnwell, Bristol's chief designer, had been working on a small twin-engine low-wing monoplane design, initially intended to be powered by the sleeve-valve Bristol Aquila radial engine, designated as the Type 135. Rothermere became aware of Bristol's proposal and, in response to his inquiry, on 3 March 1934, Barnwell issued him with a quote of the specification and performance statistics of the design, including an estimated top speed of 240 mph at an altitude of 6,500 feet. By this point, proposed use of the Aquila engine had been shelved in favour of the supercharger-equipped, poppet-valve Bristol Mercury engine. Deeming it suitable for the issued challenge, the design of Type 135 was further adapted to produce the Type 142 in order to meet the requirements outlined by Rothermere. In late March 1934, Rothermere placed an order for a single Type 142 aircraft, under which he paid for half of the estimated £18,500 cost up front and the remainder upon the aircraft's first flight in the following year. The first production Type 142M with the military serial registration K7033, which served as the only prototype and made its first flight in June 1936. On 12 April 1935, the Type 142, which had been given the name Britain First, conducted its maiden flight from Filton Aerodrome, South Gloucestershire. Flight tests soon proved that the aircraft was in fact faster than any fighter in service with the Royal Air Force (RAF) at the time, having demonstrated a top speed of 307 mph. Rothermere presented the aircraft to the nation for a formal evaluation at a potential bomber. By June 1935, the Air Ministry had become interested in the project due to its high performance. On 9 July 1935, a design conference was held by Bristol at the ministry's request into the question of converting the Type 142 into a suitable medium bomber. Based upon talks from the conference, the Air Ministry quickly formalised Specification B.28/35 for prototypes of a bomber version; the Type 142M (M for military). One principal change between the Type 142M bomber and its Type 142 predecessor was the repositioning of the wing from a low-wing to a mid-wing position, which allowed for more internal space within the fuselage underneath the main spar to accommodate a sizable bomb bay. Other modifications included the addition of a bomb-aimer's position and a Browning machine gun in the nose along with provisions for a semi-retractable gun turret in the dorsal position. Blenheim Mk I reconstruction by the Aircraft Restoration Co at Duxford, for the owners, Blenheim (Duxford) Ltd. The reconstruction is based upon a restored Bolingbroke airframe with restored Blenheim Mk I nose section with its "stepless cockpit". In September 1935, an initial contract for 150 aircraft was placed. The Air Ministry had chosen to order the type directly from the drawing board, having been urgently sought as one piece of a wider and rapid expansion of the RAF. The first aircraft built of this production model, K7033, served as the only prototype; on 25 June 1936, K7033 conducted its first flight from Filton. The service name for the aircraft became Blenheim Mk I after the famous battle during the War of the Spanish Succession. On 10 March 1937, production deliveries to the RAF formally started; 114 Squadron became the first squadron to receive the Blenheim. On 13 January 1938, the Blenheim entered service with No. 30 Squadron, the first overseas squadron to receive the type; in early 1939, the first Blenheims arrived in India. From July 1936 onwards, various additional orders were placed for the Blenheim Mk I, including multiple orders for the export market. By the end of 1936, 1,568 aircraft were on order. In order to meet the demand, secondary assembly lines were established at Chadderton by Avro and at Speke by Rootes Securities. The aircraft was built under licence by overseas countries, including Finland, who completed a total of 55 aircraft, and Yugoslavia, which completed 16 aircraft with a further 24 in advanced stages of completion when Germany invaded Yugoslavia. Other countries also procured the Blenheim, including Romania, Greece and Turkey. By September 1939, orders for the Blenheim had risen to 2,088 aircraft. Total production of the Blenheim Mk I in England was 1,351 aircraft prior to the end of the production run in 1939; production had been terminated in favour of more advanced variants. The Blenheim production program saw several shifts in requirements and in capacity. A modified Blenheim design, given the name Bolingbroke, was manufactured under licence in Canada by Fairchild Aircraft. The Bolingbroke, which had been developed in response to Air Ministry Specification G.24/35 to procure a coastal reconnaissance/light bomber as a replacement for the Avro Anson, had substantial improvements that would serve as the basis for improved variants of the Blenheim. According to aviation author James D. Oughton, both the navigator's station and range limitations of the Blenheim Mk I had been subject to considerable criticism, thus an improved model of the aircraft was desired in order to rectify these shortcomings. On 24 September 1937, an experimental Blenheim Mk I, modified with an extended forward fuselage beyond its original stepless cockpit, smooth-fronted nose enclosure, made its first flight from Filton. Formal work on an extended-range reconnaissance version started as the Blenheim Mk II, which increased tankage from 278 gal (1,264 L) to 468 gal (2,127 L). Only one Blenheim Mk II was completed, as flight tests revealed the increase in speed to be marginal and not warranting further development. Another modification resulted in the Blenheim Mk III, which lengthened the nose, dispensing with the "stepless cockpit" format of the Mk.I, introducing a true windscreen in front of the pilot, to provide more room for the bomb aimer. This required the nose to be "scooped out" in front of the pilot to maintain visibility during takeoff and landing. Both modifications were combined, along with a newer version of the Mercury engine with 905 hp (675 kW). the turret acquired a pair of Brownings in place of the original single Vickers K gun, creating the Blenheim Mk IV. In early 1939, the first batch of Blenheim Mk IVs were accepted into service; these lacked outer fuel tanks but were accepted due to the urgent demand for the type. Early Blenheim Mk IVs were also equipped with the Mercury VIII engine, most were fitted with the more powerful Mercury XV or Mercury 25 models. Further aircraft deliveries were made to the production standard and were primarily manufactured by Avro and Roots. Production of the Blenheim IV continued until June 1943, when newcomers such as the Beaufort-derived Beaufighter had succeeded the type. A total of 3,307 were produced. A long-range fighter version, the Blenheim Mk IF, was also developed. For this role, about 200 Blenheims were fitted with a gun pack under the fuselage for four .303 in (7.7 mm) Brownings. Later, the Airborne Intercept (AI) Mk III or IV radar was fitted to some aircraft in use as night fighters; these were the first British fighters to be equipped with radar. 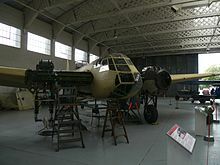 The Blenheim had been selected as the first aircraft to be adapted for this role as its fuselage was sufficiently roomy to accommodate the additional crew member and radar apparatus. Their performance was marginal as a fighter but they served as an interim type pending availability of the more capable Beaufighter derivative. About 60 Mk IVs were also equipped with the gun pack as the Mk IVF and were used by Coastal Command to protect convoys from German long-range bombers. The last bomber variant was conceived as an armoured ground attack aircraft, with a solid nose containing four more Browning machine guns. Originally known as the Bisley, (after the shooting competitions held at Bisley), the production aircraft were renamed Blenheim Mk V and featured a strengthened structure, pilot armour, interchangeable nose gun pack or bombardier position and another Mercury variant with 950 hp (710 kW). The Mk V was ordered for conventional bombing operations, with the removal of armour and most of the glazed nose section. The Mk V (Type 160) was used primarily in the Middle East and Far East. The Blenheim served as the basis for the Beaufort torpedo bomber, which led to the Beaufighter, with the lineage performing two evolutions of bomber-to-fighter. The Bristol Blenheim was a twin-engine high performance all-metal medium bomber aircraft, powered by a pair of Bristol Mercury VIII air-cooled radial engines, each capable of 860 hp (640 kW). Each engine drove a three-bladed controllable-pitch propeller, and were equipped with both hand-based and electric engine starters. To ease maintenance, the engine mountings were designed with a split-segment to facilitate rapid engine removal without disturbing the carburettors. A pair of fuel tanks, each containing up to 140 gallons, were housed within the center-section of the fuselage. The fuselage of the Blenheim employed a light-alloy monocoque structure using open-section stringers, and was constructed in three sections. The wing is also built in three section, the center-section of which is bolted and rivetted to the fuselage. The outer wing sections are tapered in chord and thickness. Extensive use of Alclad sheeting is made in elements such as the ribs, skin, flaps, and web reinforcement of the spars. The tail unit is of a cantilever monoplane style, using an all-metal tailplane and fin while the aerodynamically-balanced rudder and elevators use a metal frame covered with fabric. The undercarriage was hydraulically-retracted, with an auxiliary hand-pump for emergency actuation; medium-pressure tyres were used, complete with pneumatically-actuated differentially-control brakes. The Blenheim typically carried a crew of three – pilot, navigator/bombardier and wireless (radio) operator/air gunner. The pilot's quarters on the left side of the nose were so cramped that the control yoke obscured all flight instruments while engine instruments eliminated the forward view on landings. Most secondary instruments were arranged along the left side of the cockpit, essential items such as the propeller pitch control were actually placed behind the pilot where they had to be operated by feel alone. The navigator/bombardier was seated alongside the pilot, and made use of a sliding/folding seat whilst performing the bomb aiming role. Dual flight controls could be installed. The wireless operator/air gunner was housed aft of the wing alongside the aircraft's dorsal gun turret. Armament comprised a single forward-firing .303 in (7.7 mm) Browning machine gun outboard of the port engine and a .303 in (7.7 mm) Lewis Gun in a semi-retracting Bristol Type B Mk I dorsal turret firing to the rear. From 1939 onwards, the Lewis gun was replaced by the more modern .303 in (7.7 mm) Vickers VGO machine gun of the same calibre. A 1,000 lb (450 kg) bomb load could be carried in the internal bomb bay set into the center section of the fuselage. Like most contemporary British aircraft, the bomb bay doors were kept closed with bungee cords and opened under the weight of the released bombs. Because there was no way to predict how long it would take for the bombs to force the doors open, bombing accuracy was consequently poor. The bomb bay could be loaded using a hand-operated winch incorporated into the fuselage. To achieve its relatively high speed, the Blenheim used a very small fuselage cross-section, with its upper front glazing all at one angle in the form of a "stepless cockpit" that used no separate windscreen panels for the pilot, a notable feature of a substantial majority of German bomber designs, first conceived during the war years. Both fixed and sliding window panels were present, along with a transparent sliding roof. Other onboard equipment included a radio, cameras, navigation systems, electric lighting, oxygen apparatus, and stowage for parachutes and clothing. In September 1939, the month in which the conflict that would become known as the Second World War broke out, the Blenheim Mk I equipped a total of 2 home-based squadrons as well as 11 overseas squadrons in locations such as Egypt, Aden, Iraq, India, and Singapore. Further RAF squadrons had also received, or were in the process of converting to, the more capable Blenheim Mk IV; a total of 168 Blenheim Mk IV aircraft had entered RAF operational strength by the outbreak of war. On the day that war was declared on Germany, a Blenheim Mk IV, N6215, piloted by Flying Officer Andrew McPherson was the first British aircraft to cross the German coast to perform a high altitude reconnaissance mission upon the German Navy in the vicinity of Wilhelmshaven, Lower Saxony. The following morning, 15 Blenheims from three squadrons set off on one of the first bombing missions to attack the ships spotted on the previous day. RAF Coastal Command were soon using the Blenheim with the stated mission of protecting British shipping convoys off the east coast. Shortly after the conflict's start, the RAF Advanced Air Striking Force (AASF) was deployed to numerous airfields in France, allowing for shorter range bombing missions against German targets, including industries. Several squadrons of Blenheim IVs were assigned to the AASF, being frequently used against targets in France and the Low Countries. Blenheims were also assigned to the air component of the British Expeditionary Force of the Army. In May 1940, AASF and BEF Blenheims participated in the Battle of France, being sent against German forces moving towards Brussels, resulting in many aircraft quickly sustaining heavy damage or being lost to enemy fire. German attacks upon the French airfields also damaged a considerable number of Blenheims on the ground. On 14 May, a combined force of Fairey Battles and Blenheims was dispatched on a counter-attack upon German forces as they broke through defensive lines: 40 out of 71 aircraft were lost in this sortie. This is claimed to be the highest ever losses known to the RAF. Further action by Blenheims of Bomber Command that day sustained a 25% aircraft loss despite a high level of British fighter cover. Shortly thereafter, the mostly-depleted squadrons were withdrawn to Britain. Around 50 Blenheims supported the Dunkirk evacuation by harassing enemy forces. Rapid advances in technology which had taken place in the late 1930s had rendered the Blenheim mostly obsolete by the outbreak of the war. In particular, it had become heavier as extra service equipment was installed; much of this was found to be necessary through operational experience. This, coupled with the rapid performance increases of the fighters that would oppose it, had eclipsed the Blenheim's speed advantage. In January 1941, the Air Staff classified the Blenheim as inadequate in terms of performance and armament for current operations. Blenheim squadrons were still in immediate and high demand after their withdrawal from France as part of the British action during the Norwegian Campaign. Typically operating from bases in the northern areas of the British mainland, such as RAF Lossiemouth, flying for extended periods over the North Sea led to the weather posing almost as much of a risk as enemy combatants, particularly as most of the Blenheim IVs lacked any heating or de-icing systems; in response, some aircraft were later equipped with boilers fixed onto the starboard engine exhaust. A sizeable number of losses occurred, caused by both enemy action and mid-air engine failures due to icing. After the fall of France in June 1940, the Free French Air Force was formed at RAF Odiham, Hampshire, in the form of Groupe Mixte de Combat (GMC) 1, consisting of a mixed bag of Blenheims and Westland Lysander liaison/observation aircraft, which were later dispatched to North Africa and saw action against Italian and German forces. Blenheim units operated throughout the Battle of Britain, often taking heavy casualties, although they were never accorded the publicity of the fighter squadrons. From July to December 1940, Blenheims raided German-occupied airfields both in daylight and at night. Although most of these raids were unproductive, there were some successes; on 1 August five out of twelve Blenheims sent to attack Haamstede and Evere (Brussels) were able to bomb, destroying or heavily damaging three Bf 109s of II./JG 27 and apparently killing a Staffelkapitän identified as Hauptmann Albrecht von Ankum-Frank. Two other 109s were claimed by Blenheim gunners. [f] Another successful raid on Haamstede was made by a single Blenheim on 7 August which destroyed one 109 of 4./JG 54, heavily damaged another and caused lighter damage to four more. There were also some missions which produced an almost 100% casualty rate amongst the Blenheims. One such operation was mounted on 13 August 1940 against a Luftwaffe airfield near Aalborg in north-western Denmark by twelve aircraft of 82 Squadron. One Blenheim returned early (the pilot was later charged and due to appear before a court martial, but was killed on another operation); the other eleven, which reached Denmark, were shot down, five by flak and six by Bf 109s. Blenheim units had also been formed to carry out long-range strategic reconnaissance missions over Germany and German-occupied territories. In this role, the Blenheims once again proved to be too slow and vulnerable against Luftwaffe fighters and they took constant casualties. On 12 August 1941, an action described by the Daily Telegraph in 2006 as being the "RAF's most audacious and dangerous low-level bombing raid, a large-scale attack against power stations near Cologne" took place. The raid was a low-level daylight raid by 54 Blenheims under the command of Wing Commander Nichol of No. 114 Squadron RAF. They hit their targets (Fortuna Power Station in Oberaußem-Fortuna and the Goldenberg Power Station in Hürth-Knapsack), but twelve of the Blenheims were lost during the raid, 22% of those that took part, which was far above the sustainable loss rate of less than 5%. The England cricketer Sqn Ldr Bill Edrich was awarded the DFC for his part in the raid. Starting on 5 September 1940, Blenheims of Bomber Command began a bombing campaign targeting German-occupied ports along the English Channel, alongside heavier bomber types. Bomber Command Blenheims also performed anti-shipping patrols due to Coastal Command's own strike squadrons being heavily depleted throughout the latter half of 1940. On 11 March 1940, a Blenheim IV, P4852, became the first RAF aircraft to sink a U-boat, having scored two direct hits on U-31 in the Schillig Roads. In April 1941, a campaign aiming to completely close off the Channel to enemy shipping was launched using an initial flight of Blenheims stationed at RAF Manston. Between April and June that year, a total of 297 Blenheims of No 2. Group attacked German shipping at sea, losing 36 aircraft, while Coastal Command launched 143 attacks in the same period, losing 52 aircraft; by the end of the year, 698 ships had been attacked and 41 of these sunk for the loss of 123 aircraft. 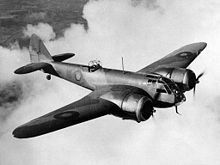 The Bristol Blenheim was used by both Bomber and Fighter Commands. Some two hundred Mk I bombers were modified into Mk IF long-range fighters with 600 (Auxiliary Air Force) Squadron, based at Hendon, the first squadron to take delivery in September 1938. By 1939, at least seven squadrons were operating these twin-engined fighters and within a few months, some sixty squadrons had experience of the type. The Mk IF proved to be slower and less nimble than expected, and by June 1940, daylight Blenheim losses were to cause concern for Fighter Command. It was decided that the Mk IF would be relegated mainly to night fighter duties where No. 23 Squadron RAF, which had already operated the type under nighttime conditions, had better success. On 11 June 1940, only hours after Italy's entry into the war on Germany's side, several Blenheim IVs bombed Italian positions. In mid-1940, reinforcement ferry routes were established throughout Africa, starting in Takoradi on the Gold Coast. By the end of 1940, a total of three RAF squadrons equipped with Blenheim IV aircraft were performing anti-shipping, bombing, and reconnaissance missions in support of Allied ground forces in North Africa. By July 1941, it had been recognised that, in response to the increasing intensity of combat in North Africa and in the Middle East theatres, additional squadrons were urgently required. In the latter half of 1941, several Blenheim squadrons were flown out to Malta, many being stationed there into early 1942 before mainly being absorbed in the Western Desert air operations. As Bomber Command gradually took Blenheims out of the Northern Europe theatre, they were often dispatched to other areas such as North Africa. Upon the outbreak of the Pacific War in December 1941, some Blenheim squadrons in the Middle East were relocated from the theatre to the Far East in response to the new threat from Japanese forces. Blenheims continued to operate widely in many combat roles until about 1943, equipping RAF squadrons in the UK and at British bases in Aden, India, British Malaya, Singapore, and the Dutch East Indies. Many Blenheims were lost to Japanese fighters during the Malayan Campaign and the battles for Singapore and Sumatra. By that point, the traditional daylight light bomber role was more effectively carried out by suitable fighter-bombers, and the surviving examples were relegated to training duties. 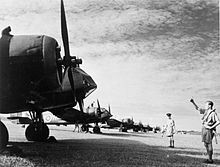 Nonetheless, the Blenheim played a role in preventing India from falling and in recapturing Burma, destroying over 60 aircraft on the ground in raids on Bangkok early in the campaign. The Air Ministry's replacement for the Blenheim as a daylight bomber, another Bristol design, the Buckingham, was overtaken by events and changes in requirements, and considered inferior to the de Havilland Mosquito, and as such did not see combat. The final ground-attack version – the Blenheim Mk V – first equipped 139 Squadron in June 1942. Eventually thirteen squadrons – mainly in the Middle East and Far East – received this variant but operated them generally only for a few months. Blenheim I (BL-111) coming in for a landing on Luonetjärvi Airfield, March 1944. BL-111 was a Series I aircraft with doorless bomb bays. In 1936, the Finnish Air Force became the first export customer for the Blenheim, ordering 18 Blenheim Mk Is, which were delivered from Britain between June 1937 and July 1938. Two years later, Finland obtained a manufacturing licence for the Blenheim. Before any aircraft could be manufactured at the Valtion lentokonetehdas (State Aeroplane Factory) in Finland, the Winter War broke out, forcing the Finns to order more aircraft from the UK. 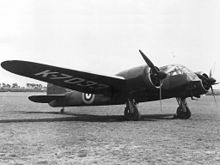 A further 24 British-manufactured Blenheims were ordered during the Winter War and were delivered from the RAF's own stocks. In the aftermath of the Winter War, 55 Blenheims were constructed in Finland, the final aircraft being completed in September 1944; this brought the total number of Blenheims in Finnish service to 97 (75 Mk Is and 22 Mk IVs). The Finns also received 20 half-completed ex-Yugoslavian Mk IV Blenheims captured by Germany, together with manufacturing tools, production equipment, and a huge variety of spare parts, although some of these had been damaged or otherwise destroyed through sabotage. Yugoslavia had ceased production of the Mk I and commenced a production run of Mk IVs just prior to the April 1941 invasion. The British-made Blenheims had RAF green interiors, RAF seat belts and instruments on imperial units, while Finnish-made Blenheims had medium grey interiors, Finnish-style seat belts and metric instruments. Series II (BL-146..BL-160): 15 Finnish-made Blenheim I bombers with deepened bomb bay doors. In service by 1941. Series III (BL-122..BL-133): 12 British-made Blenheim IV bombers ("long-noses"). Arrived in January 1940. Series IV (BL-134..BL-145): 12 British-made Blenheim I bombers. Arrived in February 1940. Series V (BL-161..BL-190): 30 Finnish-made Blenheim I bombers. In service by 1943. Series VI (BL-196..BL-205): 10 Finnish-made Blenheim IV bombers. In service by 1944. Seventh series, VII (BL-191..BL-195), six Finnish-made Blenheim I bombers, was cancelled in 1944. The usual nickname of Blenheim in the Finnish Air Force was Pelti-Heikki ("Tin Henry"). Improved version, fitted with protective armour and extended nose, powered by two 905 hp (675 kW) Bristol Mercury XV radial piston engines, armed with a 0.303 in (7.7 mm) machine gun in the port wing, plus two 0.303 in (7.7 mm) machine-guns in a powered operated dorsal turret, and two remotely controlled rearward-firing 0.303 in (7.7 mm) machine gun mounted beneath the nose, maximum bombload 1,000 lb (450 kg) internally and 320 lb (150 kg) externally. 3,307 built. An airworthy Blenheim was rebuilt from a scrapped Bolingbroke over a 12-year period, only to crash at an airshow at Denham within a month of completion in 1987. A replacement Bolingbroke Mk IVT was rebuilt to flying status in just five years and painted to represent a Blenheim Mk IV in RAF wartime service. It began appearing at air shows and exhibitions in the UK, flying since May 1993 and was used in the 1995 film version of Shakespeare's Richard III. This aircraft crashed on landing at Duxford on 18 August 2003; the crash was feared to have made it a write off. but after extensive repair and conversion to the Mark I "Short nose" version by The Aircraft Restoration Company (ARC) at Duxford, was displayed to the public on 30 May 2014, and first flew for 29 minutes on 20 November 2014, following restoration at the Imperial War Museum Duxford, Cambridgeshire, England. The aircraft appeared in the 2017 Christopher Nolan film Dunkirk. ^ a b c d e f g Moyes 1966, p. 3. ^ Barnes 1964, p. 259. ^ a b c d e f g h i Moyes 1966, p. 4. ^ a b c Mason 1994, p. 269. ^ a b c d e Moyes 1966, p. 6. ^ a b c d e f g Oughton 1971, p. 159. ^ a b c d e Moyes 1966, p. 11. ^ Moyes 1966, pp. 11–12. ^ Oughton 1971, pp. 157, 176. ^ a b c Oughton 1971, p. 157. ^ a b Moyes 1966, p. 7. ^ Oughton 1971, pp. 157–158. ^ Oughton 1971, pp. 158–159. ^ Oughton 1971, p. 158. ^ a b c d e f g h i j k l m n Moyes 1966, p. 16. ^ Oughton 1971, p. 177. ^ Barnes 1964, pp. 266–267. ^ a b c Gunston, Bill. Classic World War II Aircraft Cutaways. London: Osprey, 1995. ISBN 1-85532-526-8. ^ Moyes 1966, pp. 12–13. ^ Moyes 1966, pp. 6–7. ^ Falconer 1998, p. 212. ^ Oughton 1971, pp. 159, 161. ^ a b Oughton 1971, p. 161. ^ a b Oughton 1971, pp. 161–162. ^ a b c Oughton 1971, p. 162. ^ Oughton 1971, pp. 162, 164. ^ a b Oughton 1971, p. 164. ^ a b c d e f g Oughton 1971, p. 170. ^ Warner 2005, pp. 155–158. ^ Oughton 1971, pp. 164, 166. ^ a b Oughton 1971, p. 166. ^ a b "Obituary of Wing Commander Tom Baker." Daily Telegraph, 10 April 2006. ^ David Frith 1987, p. 365. ^ Gardner. James. "Bristol Blenheims" (Pencil and watercolour on board, 1941). National Archives. Retrieved: 22 July 2008. ^ "Photograph: Blenheim V6391 after bombing Goldenburg Power Station, Cologne." Archived 20 November 2008 at the Wayback Machine worldwar2database.com. Retrieved: 25 July 2008. ^ "Photograph: Blenheims Attack Fortuna Power Station in Cologne." Archived 16 January 2009 at the Wayback Machine worldwar2database.com. Retrieved: 25 July 2008. ^ Oughton 1971, pp. 166–167. ^ a b Oughton 1971, p. 167. ^ Oughton 1971, p. 175. ^ Oughton 1971, pp. 170, 173. ^ Lake 1998, pp. 89–90. ^ Sakaida 1997, p. 27. ^ a b Perttula, Pentti. "Bristol Blenheim." Archived 14 August 2014 at the Wayback Machine Backwoods Landing Strip: Finnish Air Force Aircraft, FAF in Colour. Retrieved: 27 June 2009. ^ Ciglic and Savic 2002, p. 62. ^ Stenman Air Enthusiast Summer 1994, p. 35. ^ "Airfield to examine safety after crash". BBC. 19 August 2003. Retrieved 2 October 2017. ^ "The Blenheim Flys – November 20th 2014." Facebook. Retrieved: 25 April 2015. ^ "Keski-Suomen Ilmailumuseon (The Aviation Museum of Central Finland)." k-silmailumuseo.fi. Retrieved: 21 July 2010. ^ "Μουσείο Πολεμικής Αεροπορίας (Hellenic Airforce Museum)." Archived 18 March 2012 at the Wayback Machine haf.gr. Retrieved: 18 April 2012. ^ March 1998, p. 43. ^ Mason 1994, p. 271. Bowyer, C. Bristol Blenheim. London: Ian Allan, 1984. ISBN 0-7110-1351-9. Moyes, Philip J.R. The Bristol Blenheim I (Aircraft in Profile 93). Leatherhead, Surrey, UK: Profile Publications Ltd., 1966. Oughton, James D. Bristol Blenheim Mk.IV (Aircraft in Profile 218). Leatherhead, Surrey, UK: Profile Publications Ltd., 1971.